INDE – Talakad - The ancient site of Talakad continues to beckon archaeologists and explorers hoping to uncover the world buried in the sands of time. And now, the Department of Archaeology, Museums and Heritage will excavate a Jain basadi reckoned to have been built in the 8th century. R. Gopal, Director (Archaeology), told that excavations conducted in the past had revealed a portion of the Jain basadi, but its importance and significance remained unclear. “It is only after it is completely excavated that we can ascertain its importance,” he said. In all probability, the excavation would commence in October and be completed by March. Talakad is one of the oldest historical sites in the State and was the capital of the Gangas in the 6th century. Located on the banks of the Cauvery, it was under the Cholas for many years and was called Rajarajapura after king Raja Raja Chola. The Chola kings constructed many temples there. Subsequently, it was captured by Hoysala ruler Vishnuvardhana by subjugating the Cholas. The Keerthi Narayana temple, which is now in ruins, and is being restored by the Archaeology Department slab by slab, was constructed to mark the Hoysala kingâ’s victory over the Cholas in 1,116 CE. The construction of a dam by Madhavamantri across the Cauvery in the 16th century is reckoned to have led to accumulation of large mounds of sands in the vicinity of Talakad, which over the centuries, got buried under it. This will be the third major excavation to be taken up at the site since the 1990s when systematic efforts were made to rediscover the buried town. Excavations unearthed portions of temples, including the Keerthinarayana temple, Pataleshwara, Maruleshwara and Vaidyeshwara. In recent years, the department has taken recourse to remote sensing and satellite imagery to explain the sand dunes. It has been attributed to the shifting course of the Cauvery in the last 500 years. ROYAUME UNI – Edinburgh - Archaeology Scotland (AS) believes the remains of a military settlement, thought to date from the second century AD, lies somewhere beneath the areas of Fairmilehead and neighbouring Buckstone in the south of the city. About 50 residents have been asked to grant archaeologists access to their gardens next month for a test dig which historians hope will uncover a nationally significant find. The site is thought to be a missing link in a chain of camps Roman soldiers used as they marched across the country about 1800 years ago. AS development manager Dianne Laing said: "We're looking for about 50 householders to make their gardens available. "The evidence for a camp is there but we don't yet know exactly where it is located." The AS researchers concluded there were probably remains in the area after examining four different maps, including one dating back to the 1760s. She continued: "There are four different maps showing what we think is a camp in slightly different locations. "What we can see from three of the maps is some kind of rectilinear embankment, which makes us think it is Roman. "But one of the maps show the embankment as oval, which could mean it dates from the Bronze or Iron Age." 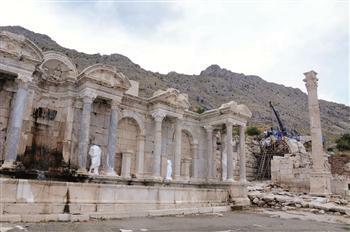 TURQUIE – Sagalassos - The latest excavations at the ancient city of Sagalassos, in the southwestern province of Burdur’s Aglasun district, have uncovered the fourth “honorary pillar” of the city’s agora. “They started the 2013 excavation season two weeks ago and the hamam, city mansion, library and neighborhoods have been revealed,” said Sagalassos ancient city excavation vice president and architect Ebru Torun. Torun said one of the most important developments of this year’s excavation was finding the fourth pillar of the agora. The pillar is 12 meters long and the sculpture part of the pillar has been unearthed. We had found the other three honorary pillars before, now we are working on them to erect them. We were wondering about the fourth pillar and we have found it in a very good condition,” Torun explained. The pillar has many special features and belongs to the first century B.C.. Noting that they had learnt the writings and the patterns on the pillar and their origin, Torun said, “In each corner of Agora there are sculptures of people that build the agora. This pillar is the fourth of them. These pillars are constructed by the famous people of the city.” Torun also said that in 2010 the Antonin fountain was the most important find of Sagalasos and that they were currently working to reconstruct the agora a whole. “We want to finish the works in the north of the area and we want to finish the restoration of the agora next year,” added Torun. USA – Kampoosa Bog – Before Puritan settlers landed on Plymouth Rock, and before Columbus sailed, Berkshire Country residents were already hunting and maintaining gardens. The Kampoosa Bog in Stockbridge is a dark and swampy lake surrounded by an old growth forest of hemlock, beech and hickory trees. The bog came into existence in the wake of the melting glacial ice, Johnson said, which dates back to about 12,000 years ago. About 20 years ago, Tennessee Gas Pipeline Company had plans to build a pipeline from Western Massachusetts through parts of Eastern New York. Before they began construction, they contacted the Massachusetts Historical Commission for clearance. Climate and pollen specialists found traces of ash from the forest trees. It's evident that the native settlers were managing the forest growth by using controlled burning to clear areas of brush, so grass and berry crops could grow freshly. These plants attracted deer and other animals, which benefited the hunters.While digging with their shovels and sharp mason trowels, archeologists found pieces of pottery, scraping tools, and spear heads, Johnson said. The spear heads were fewer than three inches long and had a small stem at the base where they could be attached to a shaft. 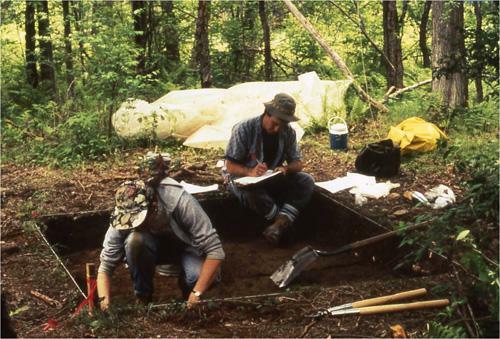 According to Johnson's findings recorded in the book "Discovering the Ancient Past at Kampoosa Bog," 95 percent of the stone material came from chert, a fine grained, glassy rock well suited for making chipped stone tools. Chert is a material found in the Hudson Valley and other parts of eastern New York, which suggests that these natives relied on trade for supplies. Only 5 percent of the stone tools found were made of quartz, which was locally available. It seems people occupied the settlement only for the fall and winter months to harvest plant and animal resources. Before leaving the area, the natives buried a bag of nine unsharpened blades to be used later. No research has been done on the construction site since the construction of the pipeline 20 years ago. 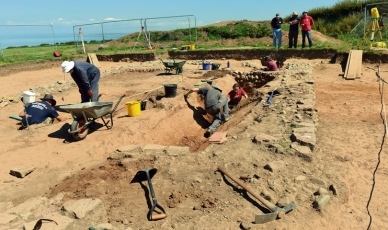 ROYAUME UNI – x Maryport - Archaeologists have found the remains of a huge Roman temple during a dig in Maryport. It is the latest in a long line of discoveries to be unearthed at the site at Camp Farm and those who unearthed it believe it could be the only one of its kind in Britain. And it has been another bumper year for the archaeologists, who have also discovered a V-shaped Roman military ditch which would indicate that there had been either a temporary tented camp there or an earlier fort. Rachel Newman, of the Senhouse Museum Trust, said: “These excavations are giving us a fuller understanding of the Senhouse collection and changing some of our previously-held views. The ‘V’ shaped military ditch discovered this year has been very exciting.” Site director Tony Wilmott said: “The ditch appears to indicate that there was a Roman influence in Maryport from possibly as far back as the early 70AD.” A second dig will begin next month in the town and will be lead by Lancaster-based Oxford Archaeology North. BULGARIE - Starosel - Archaeologists in Bulgaria have found a Thracian temple and a sanctuary of Zeus and Hera in Sredna Gora in the central part of the country. 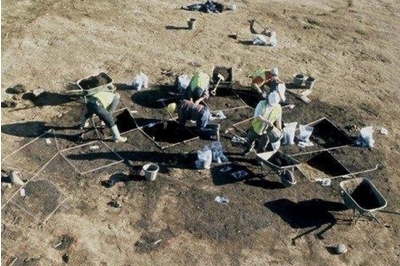 The discovery was made at a dig in the Kozi Gramadi region near the village of Starosel in the Hissarya municipality by a team of archaeologists from the National History Museum led by Associate Professor Ivan Hristov, National History Museum director Bozhidar Dimitrov told Bulgarian media on July 22 2013. The area where the large Thracian temple as well as the sanctuary of Zeus and Hera was found covers about 50 sq m. The earliest use of the site is estimated to date from the early Iron Age, about the eighth to sixth centuries BCE. The sanctuary of Zeus and Hera is believed to have been destroyed in the fifth century CE to enable Christians to build a nearby small single-nave church. Other discoveries at the site included coins from the era of kings Philip II and Alexander the Great and from the late Roman republic, as well as about 1000 fragments of ceramic vessels used for offerings in the sanctuary, Dimitrov told local news agency Focus. Dimitrov said that work by archaeologists at the site this season will continue until early September.